Last week we told you that we were going to try our whole-grain-hand at the Lahey No-Knead Bread Making Method. Well, guess what? We ended up with a tastey loaf of bread, that MaMa says was super-duper easy to make...and we didn't use a fancy, smancy dutch oven to make it either, just a regular old Pyrex dish with a lid , and it worked! Directions: In a large bowl, stir together the ingredients. The dough will be shaggy and sticky. Cover and let sit for at least 12 hours, preferably 18 hours. About 30 minutes prior to baking the bread, preheat the oven to 450 degrees. Once the oven reaches temp, place your dish in the oven to warm (without the dough in it). Once the dish has warmed, remove the dough from the bowl and form a loaf with your hands and carefully place it in the warmed baking dish. Bake for 30 minutes covered, then an additional 15 minutes without the cover. Let cool on wire rack before slicing. 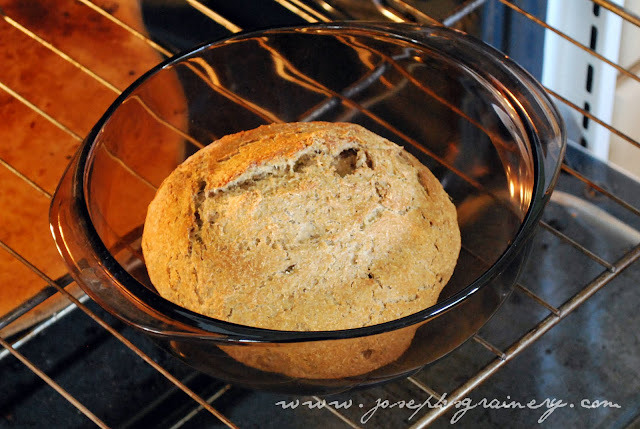 We have a Cracked Wheat version of this bread that we'll be posting soon!